I love this statement, because that’s one of the things we say automatically, one of the “ready-to-think” and “ready-to-speech” we use and don’t think about it anymore! “after all”… “After all” what? 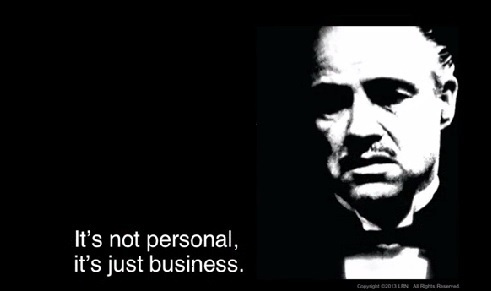 “It’s just business.” What is “just business”? This is what said one of my clients not so long ago. Undoubtedly, in his statement and resignation, a misunderstanding, a misconception hided itself. “Do things do business by themselves, for themselves and from themselves? If you put things, stuffs and even ideas and concepts in a room, does something happen? Will they start to make business together? Will they start to exchange things, money? You know like me that it won’t! It won’t because there is no will of any kind in it! A thing is simply … a thing. The use of the thing is given by a will, an intention and that gives it its value. The will, the intention belongs to living beings and in these case belongs to human beings! So after all… business is a human matter … not simply a money matter! Money hasn’t much value by itself. The value of the money is given by the use we make of it! 2) and what does say this relationship about him or how does this relationship define him? So, we explored this together. Even if it was obvious to me, we had to make this work. We identified the gaps between how he defines himself and what the non written functioning rules of his relationship define him. Just for the sake of this article basically, his customer relationship left him powerless, with a depreciating feeling of himself and less and less engaged to deliver the best service possible. So he was very uncomfortable right now and with the pursuit of this relationship. The details of the work we did together will remain confidential. 3) If someone is not comfortable, depreciated in anyway, the whole outcome value will be less than what it could be if all the protagonists are at ease and in a gain-gain relationship. A loose-gain relationship delivers less value than a gain-gain one. 4) This example goes beyond the customer relationship management. It applies as well to organizations’ issues such as (for example) employee engagement/retention. If you have no methodologies, processes to identify and create what could be the employee “gain” (beyond salary and other money related benefits) then it will be very difficult to engage and retain them more than what they are. About the author: Xavier BARILLER helps to build strong, healthy and sustainable relationships within organizations, between business partners, and with clients.